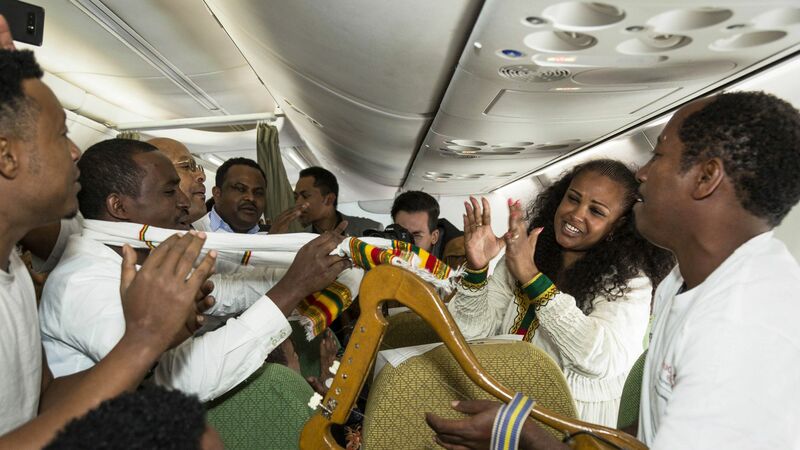 The first commercial flight between Ethiopia and Eritrea in two decades took place today after a landmark agreement between the two countries earlier this month ended a prolonged and deadly border dispute. The details: Passengers celebrated the historic event, taking selfies, as well as dancing and singing during the 60-minute flight, per BBC News. Some reportedly broke-down in tears upon their arrival in Asmara, as they met relatives and friends for the first time since the standoff started in 1998. Local reports said tickets for the inaugural fight from Addis Ababa to Asmara on Ethiopian Airlines sold out within few hours. The airline shared a photo on Twitter of two pilots in the plane's cockpit. "The clock is ticking for our historic flight to #Asmara. #Familyreunion #Ethiopia #Eritrea," the tweet reads. The backdrop: Border tensions between the nations stem from Eritrea's secession from Ethiopia in 1993. A peace agreement was signed in 2000 to end the conflict, but hostilities persisted. The countries' leaders last week declared an end to the war.